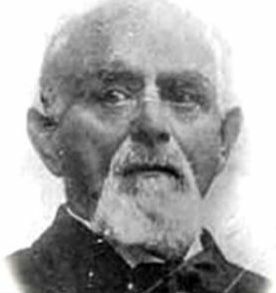 Jacob Youphes was born in Riga, Latvia, in 1834. While growing up in Latvia, Jacob Youphes was trained to be a tailor. He arrived in New York in 1854, and changed his name to Jacob Davis. During the next few years, Jacob Davis moved between San Francisco, Maine, and Canada, and then back to San Francisco. In 1868, Davis and his family moved to Virginia City, Nevada. Later in 1868, Jacob Davis and his family settled in Reno, Nevada, where he invested in a brewery and almost loses everything. 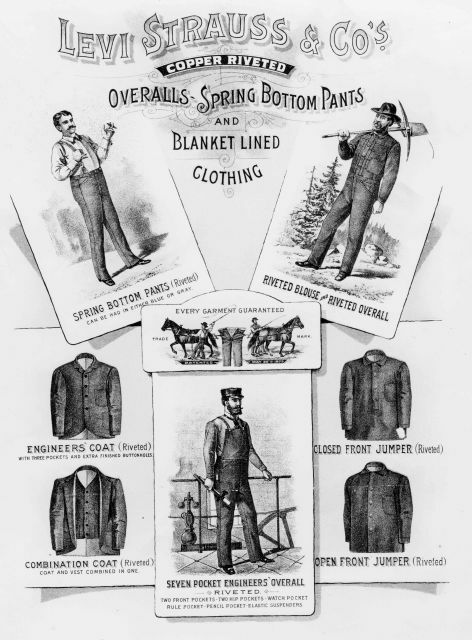 The following year, Davis opened a tailoring business, specializing in tents, wagon covers, and horse blankets for the crews building the railroad. His basic fabrics were heavy-duty cotton “duck” and “denim,” which he purchased from Levi Strauss & Co. in San Francisco. A year later, Jacob Davis expanded his business to make work overall clothing for railroad workers, miners, and farmers. One customer suggested that he use the same copper rivets on the pants’ pockets that he was using to strengthen his other products. He contacted Levi Strauss and suggested that they apply for a patent on the rivets and cloth combinations. The original patent was turned down as being too broad, but a patent was eventually granted (#139121) for the work clothes. David and Strauss were partners on the patent. 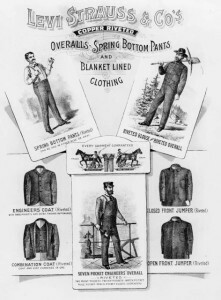 In 1873, Strauss invited Davis to move to San Francisco, where they would first set up a workshop and then an ever-expanding factory to make the new line of work pants, known today as the Levi 501 brand. Also in 1873, Davis designed the trademarked double-row stitching on the back pockets. Davis worked with Levi Strauss & Co. the rest of his life. Jacob Davis married Annie Parksher while in Canada. Together they had 6 children. One son, Simon Davis became head of the Levi’s Manufacturing Co. after his father’s death. Jacob (Youphes) Davis passed away in 1908. Norton B. Stern and William M. Kramer, “Levi Strauss: The Man Behind the Myth,” Western States Jewish History 19/3. John Michael, “Levi Strauss: The Man, His Family, and My Family,” Western States Jewish History 45/4.